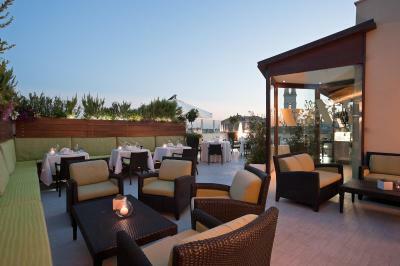 Lock in a great price for Risorgimento Resort - Vestas Hotels & Resorts – rated 9.1 by recent guests! Great cental location. Got upgraded to a beautiful suite. Front desk staff very helpful and friendly, arranged for a private guide, and made great dinner recommedation to scarpetta restaurant. 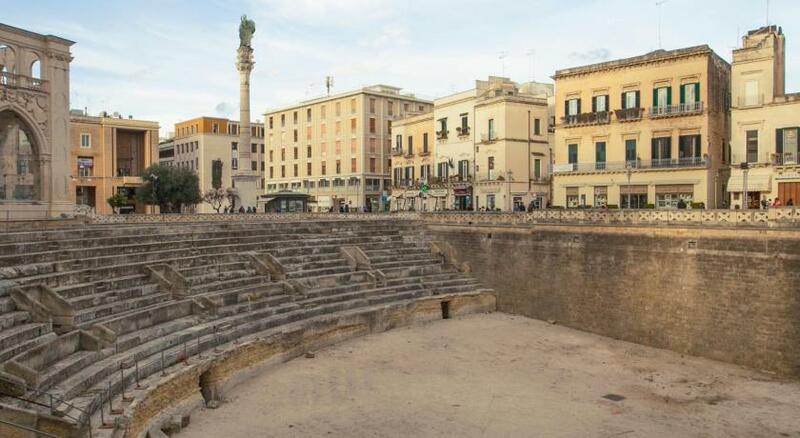 Excellent location to explore the coastal cities on the peninsula, to visit points of interest in the area, and a few steps for walks in the very popular main square. The hotel was in the heart of city center. It’s very easy to walk around for sightseeing. The room is quite clean and new. Staff was friendly and welcoming and we received helpful restaurant and day trip suggestions. 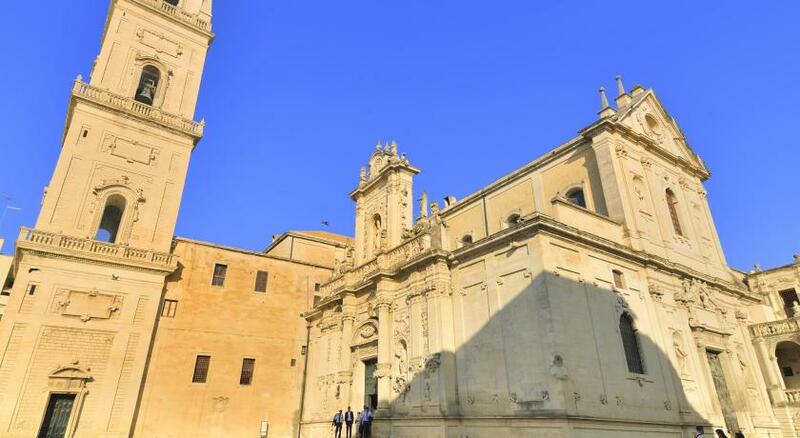 Hotel is in a great location in the city center within Lecce. Valet parking was easy to use. Extremely well located, nice spacious rooms with great bathrooms. Perfect location right in the very heart of the historic quarters. Huge bed, very comfortable room. Great breakfast buffet and very kind staff. 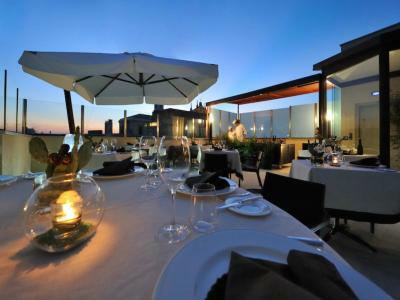 Risorgimento Resort - Vestas Hotels & Resorts This rating is a reflection of how the property compares to the industry standard when it comes to price, facilities and services available. It's based on a self-evaluation by the property. Use this rating to help choose your stay! Featuring a roof-top restaurant with panoramic views, the Risorgimento Resort is in Lecce’s Baroque historic center. It offers free Wi-Fi throughout the property, large modern rooms, and a relaxing spa. 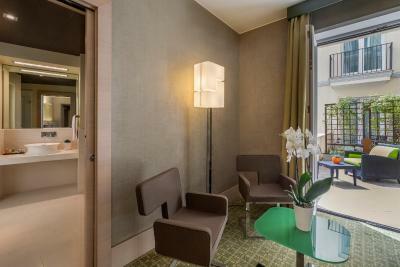 Rooms are air-conditioned and include a minibar and satellite TV. Each has a marble bathroom with bathrobes and slippers. The attentive staff provides a continental buffet breakfast. 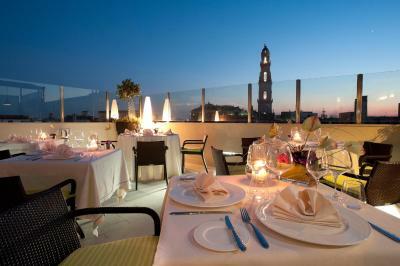 The 3 restaurants offer both Salento flavors and classic Italian cooking. Drinks and snacks are available all day at the Janet Ross Bar. The health club features a Turkish bath and multisensory shower. Massage and beauty treatments are also available. 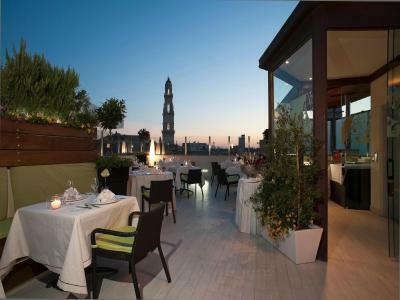 Piazza Sant’Oronzo is just 350 feet from Risorgimento Resort - Vestas Hotels & Resorts. The Cathedral is a 5-minute walk away. When would you like to stay at Risorgimento Resort - Vestas Hotels & Resorts? Large room with a 32" LCD TV. 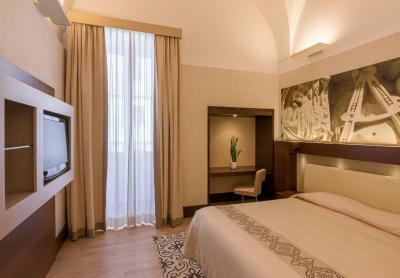 Offers an extra-large bed, sitting area, 42" LCD TV and a large balcony. 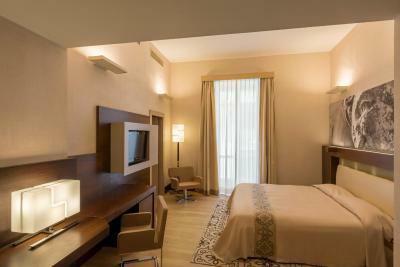 Large room with 32-inch LCD TV. It includes 1 sun umbrella, 2 deck chairs and 1 lounge chair on the beach. 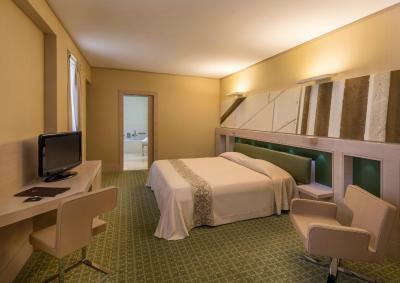 Large room, with an extra-large bed and a 32" LCD TV. Includes a 25-minute spa treatment per person, free access to the gym and hammam, and a buffet breakfast with traditional products. House Rules Risorgimento Resort - Vestas Hotels & Resorts takes special requests – add in the next step! ATM card Risorgimento Resort - Vestas Hotels &amp; Resorts accepts these cards and reserves the right to temporarily hold an amount prior to arrival. Risorgimento Resort - Vestas Hotels & Resorts accepts these cards and reserves the right to temporarily hold an amount prior to arrival. A parking garage is available at the hotel, which is in an area with restricted traffic at night. You can still get to the hotel by car at night if you let the hotel know your registration plate in advance. The room had no view whatsoever, bed was really uncomfortable in my opinion (too soft, huge pillows). We got a drink at the bar and it was ridiculously overpriced. We expect the buffet breakfast may provide some more varieties to choose from. When it rained, the carpet became wet...not sure how the water got in as the window was closed. I never did figure out how to make the TV come on...it was trial and error. A minor issue we had was with hot water one day was quickly fixed by a friendly staff and a trip to the spa. Breakfast was supposed to start at 07:00, but by the time I arrived at 07:15 there were no clean tables available and the buffet looked like a bomb had hit it. When I asked for a plain croissant I was told that they could pick the top layers off an almond one!! Hardly the stuff of a five star hotel. Excellent location, excellent facilities, helpful staff good value for money. It was the best place we stayed during a 7 day trip in Southern Italy. 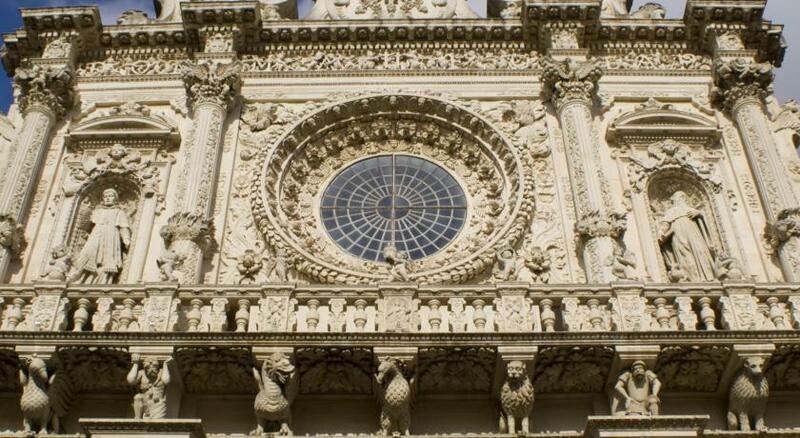 Excellent location for visiting Lecce and the surrounding area. The staff was extremely helpful. Our room was very large and the bed was very comfortable. I wouldn’t rate this hotel as 5stars or describe it as a resort hotel. The room facilities were very basic, no kettle or tea/coffee facilities. They couldn’t even provide a kettle upon request- so feeding my baby was impossible in this hotel. I ended up using ready to feed infant milk which I had to heat from the fridge with tap water. They have treatment rooms for facial / massage and a steam room. All are by appointment- including the steam room which I was told would only take one person. I had some treatments which were fairly good, Monica who is the beauty therapist was very nice, but I would have expected more facilities in an establishment claiming to be a ‘resort’ They were also unable to provide me with an iron citing health & safety reasons...!?! While they offered to take the items & have them ironed it’s not ideal when you need them then & there. The staff were without exception, incredibly friendly & helpful. The location was excellent. No information about hotel in room, breakfast times etc. We had read that rooms were large but ours was very average. 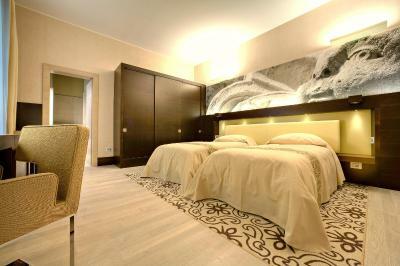 The position is excellent, close to Anfiteatro and Piazza Sant’Oronzo, 5’ walk to Duomo. The breakfast is good, there is a wide choice of cakes and fruits, veagetables and ham complete the table. The room (executive) is clean even if there is moquette I don’t like, but this is a my preference, bathroom is wide and it is provided with shower and bathtub as well. This hotel has all services you can need. THE STAFF DOES NOT CARE FOR ANYTHING. ONLY ONE SPEEKS ENGLISH. TO MUCH EXPENSIVE FOR THIS ROOM OR SERVICES.NOTHING SPECIAL.